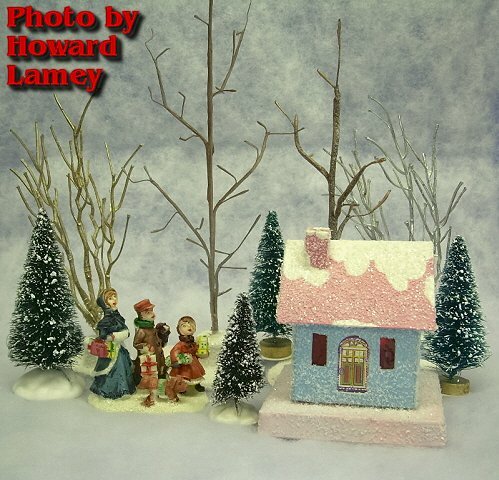 Note from Editor: Glitterhouse designer/builder Howard Lamey uses floral picks to make bare-looking trees for his villages of vintage-style cardboard structures. This is how he explained it to me. 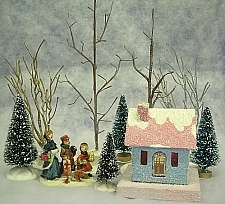 Here's an easy way to use winter trees to add another layer of texture and color to your Christmas village or putz (cardboard house village). And they only cost about fifty cents each to make. I use artificial flower "picks" from a craft store or dollar store. Look for picks that would have a believable branch structure when the flowers are removed. The “craft store” picks I used were on sale for 50-cents each and the “dollar store” picks were two on a card for $1. On many picks, there are barbs on each branch tip to hold on the petals, leaves, or other trim. Pull off the petals, leaves or other trim. 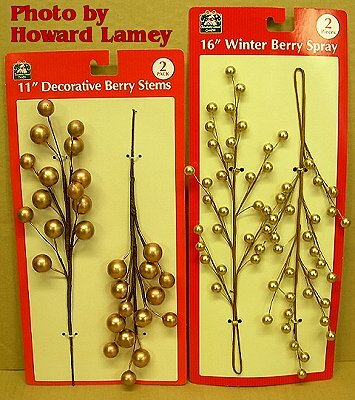 If the branch tips come off, too, put them back on after you've separated them from their foilage. In the picks shown at the right, it was easiest just to clip off the round balls. Caution! The tips of the branches will be sharp, so be careful. Remember, these are decorations, not toys for children. Trim the excess off the bottom end of the picks to make them shorter. 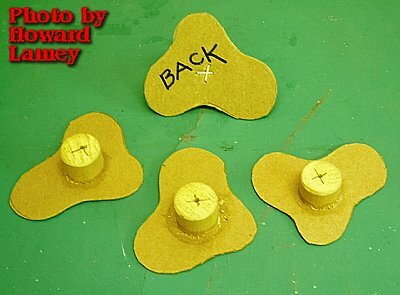 Cut a piece of stiff cardboard into an oval, triangle, circle or square. Mine were cut into a free-form design with gentle curves and no sharp points. Cut 3/4-inch long sections from a 3/4 to 1-inch diameter wooden dowel or broom handle. White glue the dowel section to the cardboard base and staple from the back. Drill a hole in the dowel to fit the diameter of the floral pick. Fill the hole with white glue, insert the floral pick and let dry. Prime the base with flat white wall paint. You may need 2 coats since the cardboard and end grain of the dowel will soak up much of the first coat. When the primer is dry, spray paint the trunk and branches with a “mist” of white, tan, gray, light blue, silver or gold. You can even spray them a solid color to fit in with your color scheme. Cover the white base with a rag while you spray the trunk and branches. 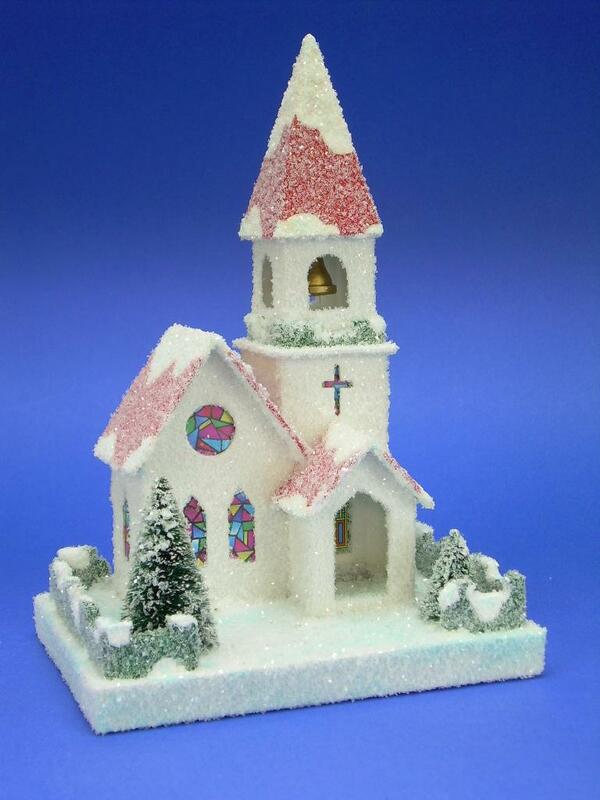 Coat the cardboard and wooden dowel base with white glue and sprinkle on the clear glitter. Remember, these still have pointy wire tips, so don't let small children play with them. But you can play with them all you want. In the photo to the right, Howard has posed them behind a different house. How the base is finished depends on what the rest of the house looks like. If the house is set in a season other than winter, you may want to paint the base with a different colored topcoat before you attach the house and accessories. 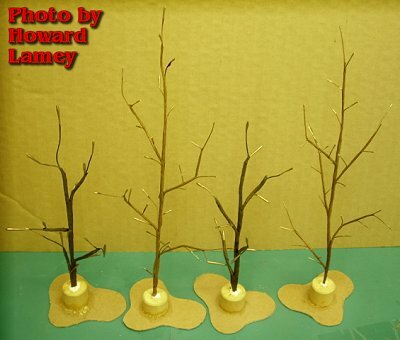 For other article on making scenery trees for indoor trains and towns, check out the following links. 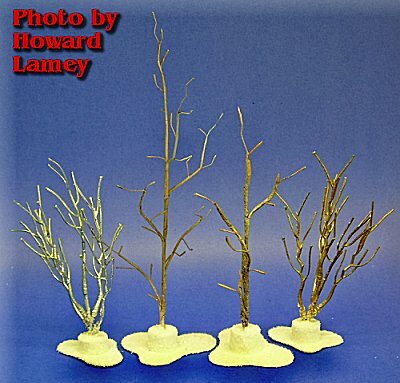 Free Scenery "Set Pieces" - Use scraps to add vertical dimension and arrangment possibilities to your display. 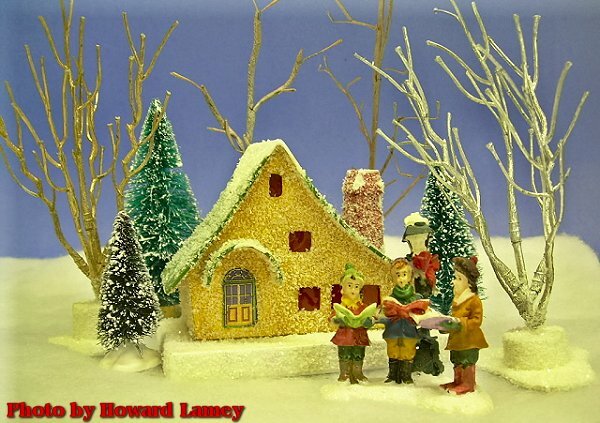 This craft can easily be adapted for any time of year. Portable (Foam-Based) Indoor Displays - Using a foam-based portable scenic foundation to display your trains and towns to their best advantage. Desert Accessories from Playmobil Products - How repainting carefully-chosen toys can add fun details to a Large Scale desert landscape New, August, 2008! Bringing Autumn to Your Railroad or Display Village - How two easy crafts can make your model railroad or display village look like it is enjoying the fall season. New, September, 2008! 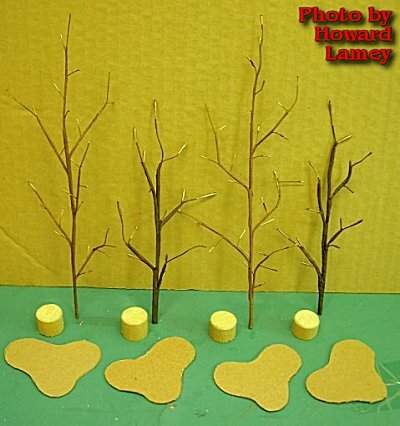 Add Spring Color to Your Village or Indoor Railroad - How to use "Easy Homemade Trees" to brighten your railroad or display village for spring. Updated, November, 2008! For more scenery ideas, check out our Scenery Tips page.